The following dialer (called RP3) is available on any RedHat Linux install of version 6.2 or later. It is by far the easiest dialer installation and highly recommended. To find it goto your GNOME menu under INTERNET. It should be called DIALUP CONGIGURATION TOOL. 1.) Once you see the above screen click on NEXT. 2.) Your system will try to find your modem. If it can't, it will ask you to configure a new one. 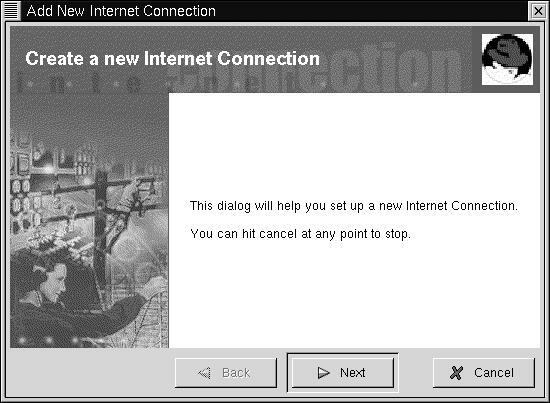 If rp3 can't find a modem, it will try to configure one. Select your modem from the list it provides and click NEXT. If successful you will see an account name screen. If not then your modem is not configured or installed properly. Please refer to your modem vendor documentation. 3.) At the ACCOUNT NAME screen enter WEBCS.COM DIALUP for the account name and then enter the primary number you will dial into to use our service. Click NEXT. 4.) Enter the username and password we provided in your setup email exactly. Click NEXT. 5.) When the system asks if your ISP is named in a list select no or select NORMAL ISP. Click NEXT. 6.) Hit the FINISH button. Your done! 7.) To dial into our network, visit the GNOME menu and look under Internet for RH PPP DIALER. Click on it. Then select interface PPP0. A terminal window should launch. 8.) On the new window RIGHT CLICK and select CONNECT TO PPP0. The modem should dial out. 9.) For problems please visit the RP3 website.